After the much-publicised debacle of Samsung Galaxy Note 7, the anxiety around the series’ next iteration- Galaxy S8 knew no bounds. So without any more wordplay, let’s get to the basics of the new smartphone. Spoiler Alert: There would be little in terms of ‘out of the blue’. Rumour mills kept us abreast with almost everything that the Galaxy S8 boasts of. Starting with the near bezel-less display that gives you more screen and a completely new form factor. Samsung is calling it the ‘Infinity display’. Available in 5.8-inch Galaxy S8 and 6.2-inch Galaxy S8+, the Infinity Display and bezel-less design form a smooth, continuous surface with no buttons or harsh angles. The resolution is (as leaks suggested) 2,960 x 1,440, owing to the company’s shift in aspect ratio. Samsung has followed LG’s lead and shifted to a much taller phone, which, along with the built-in HDR support is part of the company’s attempt to let content providers offer video truer to their initial intentions. Both the smartphones are powered Samsung’s Exynos processor and Qualcomm’s top-end 835 processor, depending upon the market. The Snapdragon 835 is roughly 35 percent smaller in package size and consumes 25 percent less power compared to the previous generation flagship processor, which equates to longer battery life and a thinner design. The processor also supports next-generation immersive entertainment experiences, such as mobile virtual reality (VR), with leading edge still and video capture. This platform allows the Galaxy S8 to support Gigabit LTE, for fiber-optic Internet speeds on the go, and more consistent mobile data performance in more places. 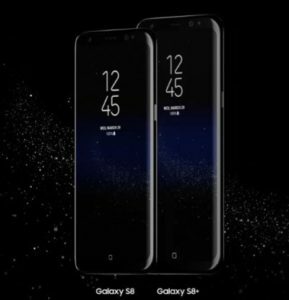 According to the company, the Galaxy S8 is the first smartphone to feature Qualcomm® TruSignal™ adaptive antenna tuning technology for carrier aggregation, designed to deliver a more consistent voice and data experience, indoors and outdoors. The two smartphones also feature 4GB of RAM, and 64GB storage, which can be expanded up to 256GB using a microSD card. Both the smartphones run on Android 7.0 Nougat out-of-the-box with TouchWiz UI on top. For power, the Galaxy S8 packs 3,000mAh battery, while the bigger one gets a larger 3,500mAh battery. The S8 sports a virtual touch-sensitive button on the bottom. And in the place of the biometric fingerprint reader, you can unlock the phone with either your retinas (a feature offered on the dearly departed Note 7) or by scanning the whole of your face. Both the Galaxy S8 and S8+ are equipped with an advanced 8MP F1.7 Smart autofocus front camera and 12MP F1.7 Dual Pixel rear camera for the best low-light, zoom and anti-blur photos with enhanced image processing. As for performance, Samsung has devised an all new, industry-first 10nm processor, enabling heightened speed and efficiency. It is also gigabit LTE and gigabit Wi-Fi ready with support for up to 1 Gbps. But the real star of the new launch is the Bixby assistant. The digital assistant works coherently with the native apps. The AI is not only contextually aware; it lets you perform a range of interactions, including app launch to a task within an app. “As the Bixby ecosystem grows, it will connect across devices, apps and services as a ubiquitous interface, and open up new experiences and scenarios to simplify life,” says Samsung in a post. The company had added some interesting contextual information, so the assistant can get a better sense of what you want based on what else you’re doing in an app, for example. Samsung calls it “cognitive tolerance.” The company has also promised to open it up to all sorts of third-party compatibility with a goal of letting users do with their voice everything else they’re able to do in an app via touch. Both the phones will be available starting April 21st. Keep checking this space to know on India availability.